3 Package follows a parabolic path and remains directly below the plane at all times. 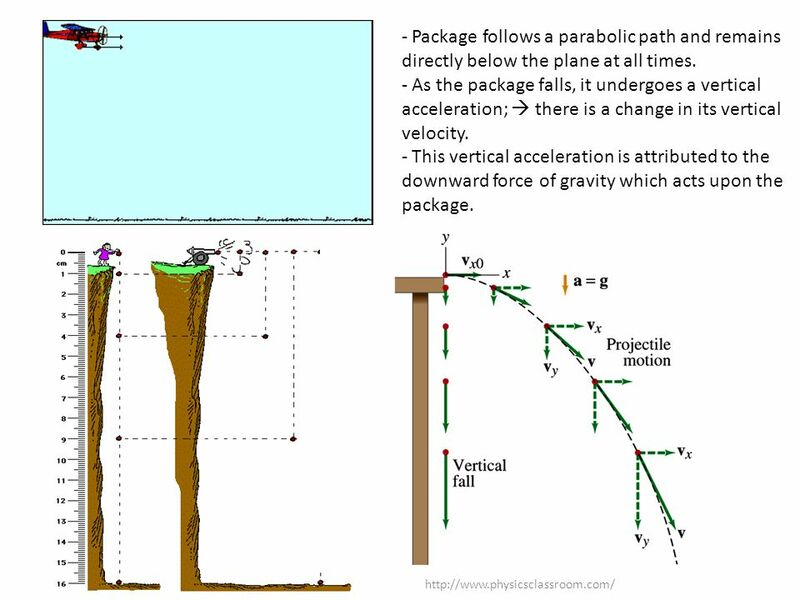 As the package falls, it undergoes a vertical acceleration;  there is a change in its vertical velocity. This vertical acceleration is attributed to the downward force of gravity which acts upon the package. 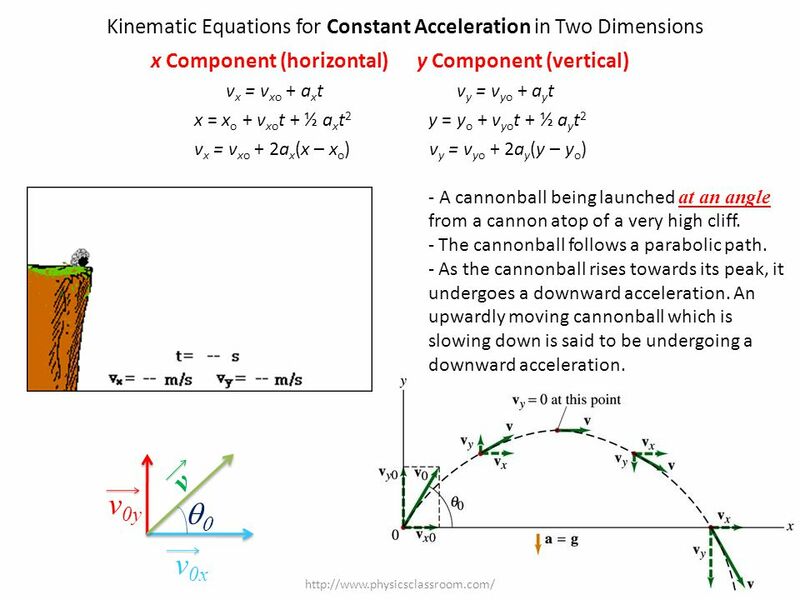 5 "Physics" by Giancoli, 6th ed. Conceptual Example 3-6/pag. 59: Where does the apple land? A child sits upright in a wagon which is moving to the right at constant speed as shown. 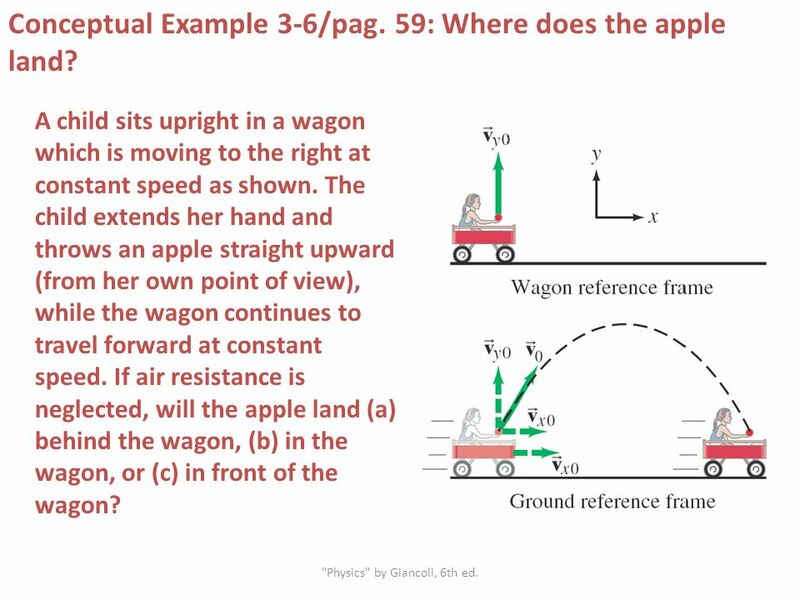 The child extends her hand and throws an apple straight upward (from her own point of view), while the wagon continues to travel forward at constant speed. If air resistance is neglected, will the apple land (a) behind the wagon, (b) in the wagon, or (c) in front of the wagon? Figure 3-25. 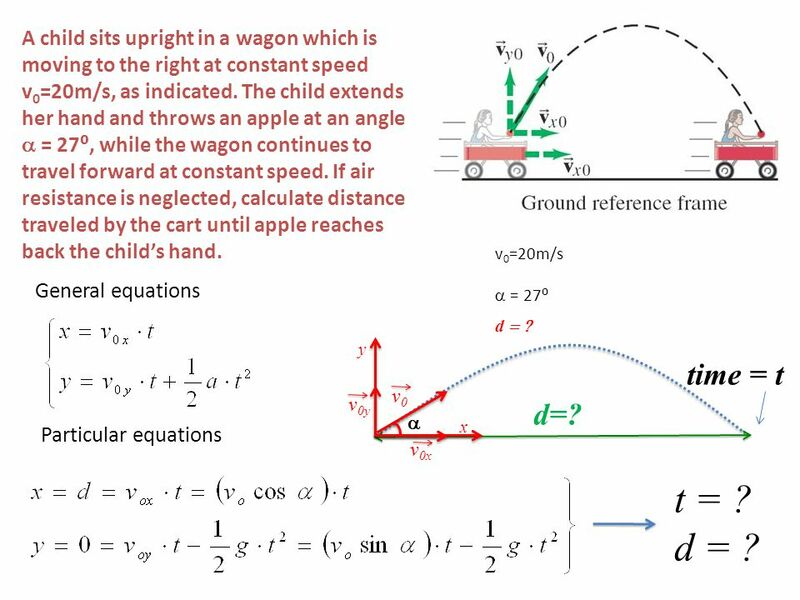 Response: The child throws the apple straight up from her own reference frame with initial velocity vy0 (Fig. 3–25a). But when viewed by someone on the ground, the apple also has an initial horizontal component of velocity equal to the speed of the wagon, vx0. Thus, to a person on the ground, the apple will follow the path of a projectile as shown in Fig. 3–25b. The apple experiences no horizontal acceleration, so vx0 will stay constant and equal to the speed of the wagon. As the apple follows its arc, the wagon will be directly under the apple at all times because they have the same horizontal velocity. When the apple comes down, it will drop right into the outstretched hand of the child. The answer is (b). "Physics" by Giancoli, 6th ed. 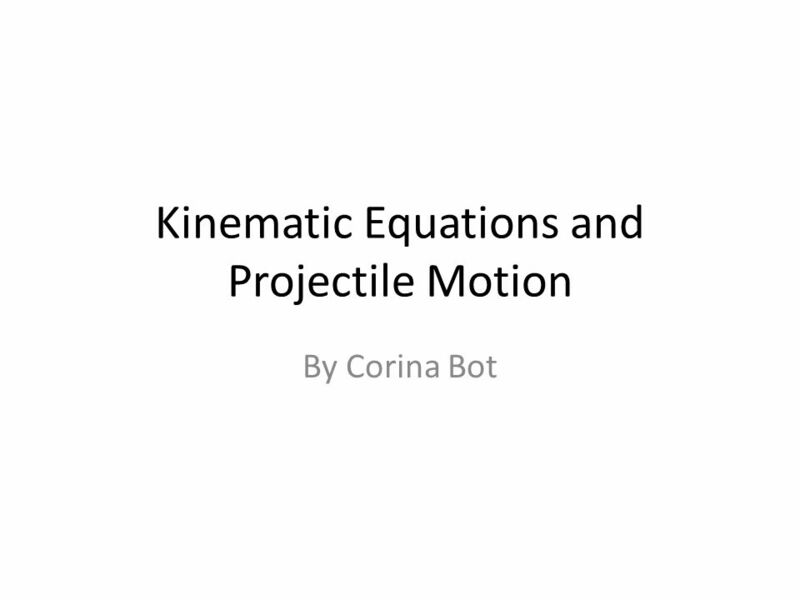 Download ppt "Kinematic Equations and Projectile Motion"
Kinematics in Two Dimensions Chapter Equations of Kinematics in Two Dimensions Equations of Kinematics. Motion In Two Dimensions can be considered constant. Projectile Motion Neglecting air resistance, what happens when you throw a ball up from the back of a moving truck? Front? Behind? In? 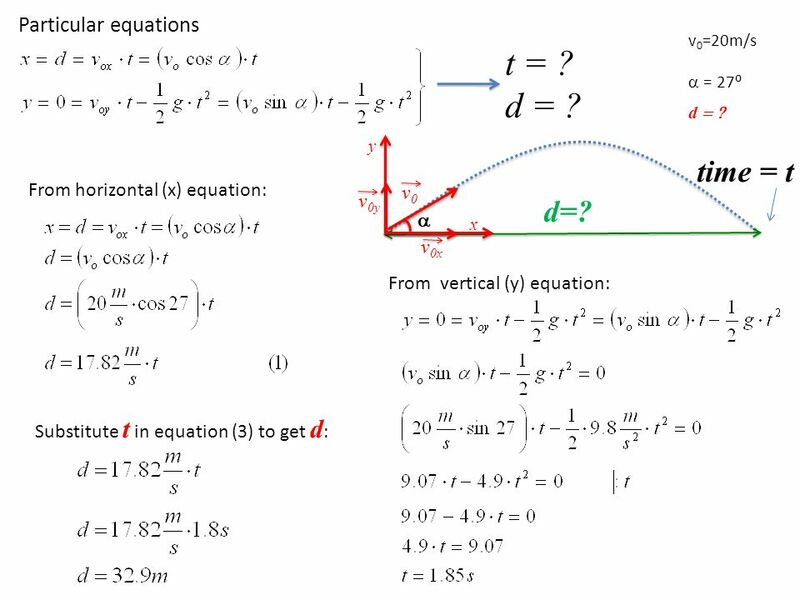 High School by SSL Technologies Physics Ex-32 Projectile motion is the vectorial sum of two independent velocities, a horizontal component and a vertical. PROJECTILE By, Dr. Ajay Kumar School of Physical Education D.A.V.V. Indore. Aim: How can we approach projectile problems? Warm - up Problem: A sprinter accelerates from rest to 10.0 m/s in 1.35s. a.) What is her acceleration? b.) How far has she traveled in 1.35 seconds? 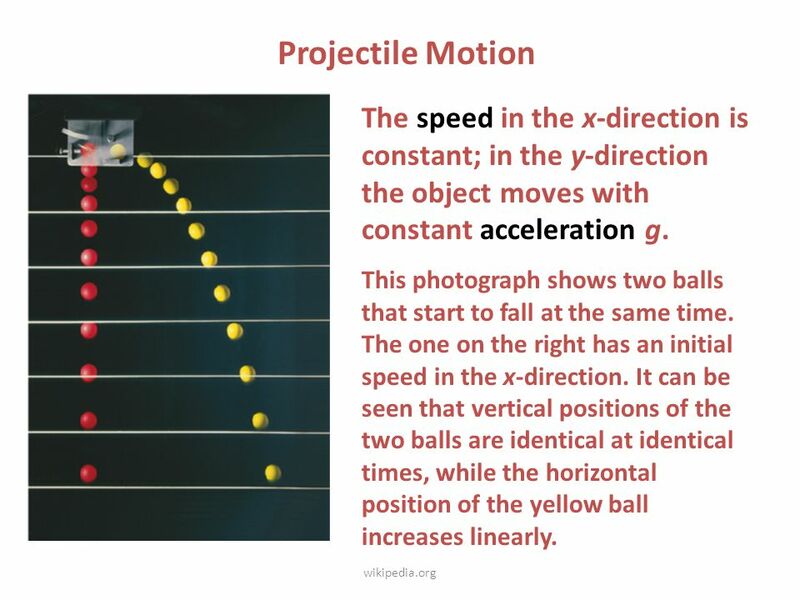 Projectile Motion February 4, Projectiles & Motion Projectile: an object thrown, kicked, hit, or launched through the air. Projectile Motion: motion.